Decided to use the leftover top of my old jeans that were left over from my garden jean cap that I previously made and posted the instructions on the instructables.com web site. I was able to make a purse and a pillow. I posted the instructions on how these were made on the Instructables web site if you wish further information on how to make these items. Please feel free to play with any of the ideas on this site and be as creative as you wish. I am also posting the pictures of an apron that I enhanced with leftover fabric that was purchased and a craft store on clearance for $1.75. I was also able to make a matching wine sack and plan on using it for a gift after adding a bottle of wine from a local winery. 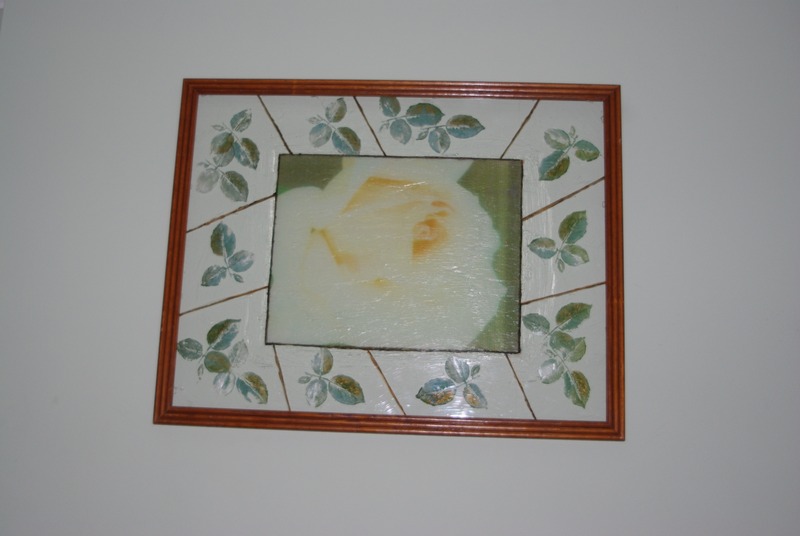 Using a 22″ x 28″ frame with plexiglass, I adhered a photo of a pink rose that I printed on a 13″ x 16″ piece of tracing paper. I had to line the leading edge of paper with masking tape so the printer would recognize it to print. The gloss varnish I used gave the paper an unusual puckered appearance that I liked. I wanted to give it a stained glass appearance so I outlined the picture and painted out from it to the edges in various sizes to make it appear to be sections of glass. 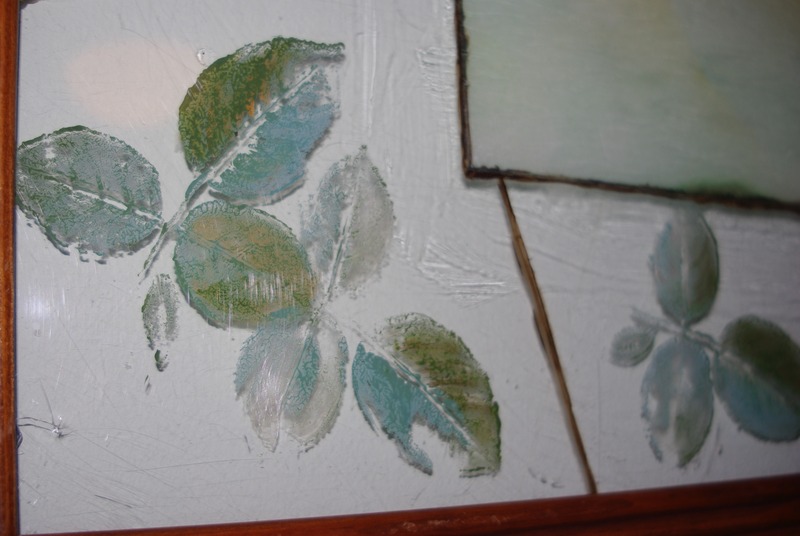 I used a raw umber color for the fake lead solder and used my rose leaf stamp in colors of green and gold to stamp in each of the areas surrounding the rose transfer. Close up of the leaves. 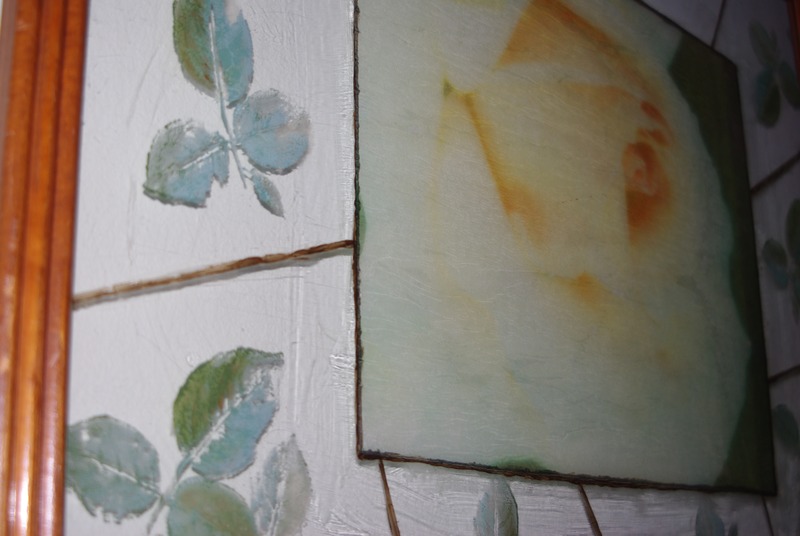 Nice effect when you hang it on the wall because the paint color shows through as well as images casting a shadow. Love experimenting with art effects. Planning on creating another one with an autumn feel. Just wanted to post some of my recent projects. I hope to have an etsy shop very soon and have included various states of some of my projects. The first one is a slide show of a pot holders sewing project that matches an apron previously made. I used to only use transfer paper on my fabric, but this time just printed some of my photos on printer paper and adhered them to fabric and glass with acrylic matte medium so I can use them for natural jewelry pieces and embellishments using beads, eyelets, paint, threads, etc. I just like to play around and see where my imagination takes me sometimes. I purchased some Crayola air dry clay in white to make odds & ends of pendents using molds and stamps to shape and alter for jewelry. I inserted wire to hang or attach. 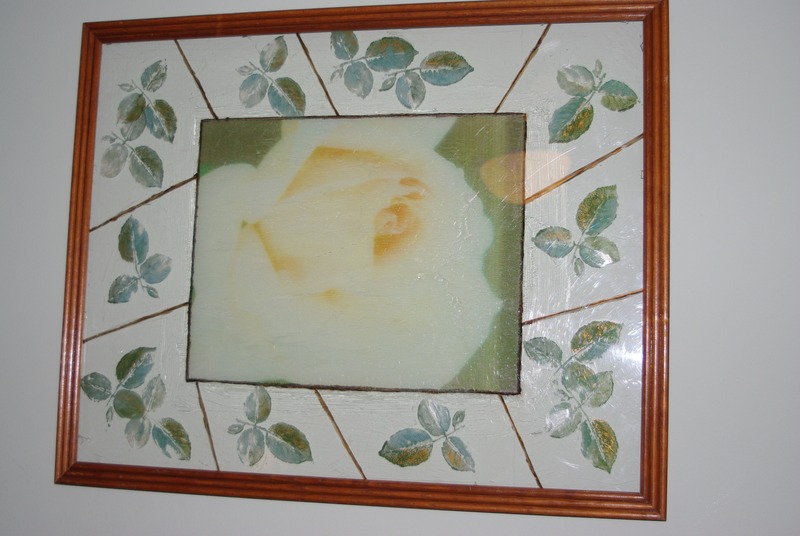 Update to come later after painting or decoupaging tissue to show how something so cheap and easy can look really good. Just starting another instructable for a nightgown made from a Queen size bedsheet, flat. I tea stained the fabric first to give it a vintage look. Decided to upcycle a thread-worn cream colored turtle neck sweater. Cut down the center to insert a zipper. I am in the process of sewing on strips of faux fur. A little piece of Calumet Michigan, wishing I was there! Love the Upper Peninsula! Just a goof-off statement about pollution, that is a very serious matter! Still missing my little baby Raizen, waiting for me to come home after work. Can’t believe it is already September, and 2012 yet! Didn’t even bother to buy any 2013 Calendars, how about you all? Was featured again on Instructables. I plan on having much more information on that site in the near future. Food, sewing and crafts. My latest featured was Drawstring purse with cubbies inside to put things in. Again this step by step “how-to” can be found on instructables.com. Hope to have more info soon on Po’ Girl hand made clothing and will let you know when the etsy store opens! Coming soon to a forest or woods near you! Crafted a fabric bowl with yarn and button trim years ago. Love throwing my jewelry into it after a hard day, then I can hang them back up where they belong When I have more time. My potatoes are about the only things I have gotten out of my garden this year, says someone who normally has a very green thumb. It was more varmints than the drought. I had so many rabbits, squirrels and chipmunks this year, it was not funny. It is my own fault because I have a deck, they can hide or live there. I have lots of shrubs, trees and plants because I want to make my yard as much like nature as the city will let me get away with. I also have a small fountain, bird bath and keep a small amount of water in a tub for the thirsty squirrels to keep them from climbing into the bird bath. Found a stone fountain clearanced at Krogers to go with the rock theme of my yard. Always keeping my eyes open for a bargain. My yard is now semi-private and when I do glance over to some of the other yards near me, I am reminded of a depressed neighborhood. Some have a couple of plants or place one lone shrub at the far end of the yard. Most have no landscaping what-so-ever and instead barren, dying grass. Some of our neighbors have put out perennials in front of their yards with “free flower signs” after dividing, which is so nice. I will be doing the same next year with hostas if I am still here. I understand some don’t have the time or the money, but it is not very expensive to buy a few on sale and divide the next year or start them from seed. I guess you are either a plant person or you are not. I just love plants of all kinds and they help the environment in many ways. I started my first garden years ago in the burbs with un-amended hard clay soil. My plants were great. I have no idea how some of the seeds ever took root, but they sure did. The difference was I had no varmints there. You never even saw one squirrel. There were woods nearby and obviously the bigger varmints got the little ones before they became a problem. Once in a while you saw, and smelled a skunk. This year they got the green beans, both bush and pole, all squash, Spinach didn’t stand a chance, and most of the lettuce. With some things, such as beets and carrots, either the germination was terrible, or the birds were eating the seeds as well, they got all the black and red raspberries this year. I just happened to have a couple of left over Russet potatoes that were sprouting at the end of May so I threw them in the garden with the hopes of getting a few potatoes. They are still there and I hilled them this year. I will let you know how many I get from both plants in a later post. The first one was sweet with tender skin and very good. Hope the rest of you are able to enjoy your harvest this year. God Bless!